Want to Start with a Blank Canvas? Whether it’s clearing an entire site or just removing that unwanted tree, shrub or hedge, Advantage can do it all. Maybe the lawn is bare beyond repair – or your flowerbed is full of nettles instead of petals... There could be tumbledown sheds, falling down fences or cracked and broken slabs that need to be removed. So, whether it’s rubble, ragwort or roots, the team at Advantage can take the pain away – and all the debris too! 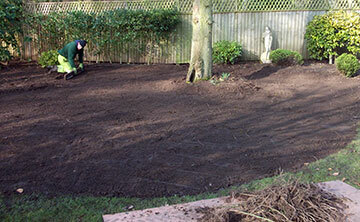 And once the unwanted items are removed, we can also prepare the ground for your new garden layout: setting levels, organising replacement topsoil for seeding or turfing a new lawn, digging out holes or trenches for ponds and water features and laying greenhouse or shed bases.